I have ONE more review in me this month, not including this retro one for XIII, a very stylistic first-person shooter for the PlayStation 2, GameCube, and Xbox. Is beauty only skin deep with XIII, or is there a capable shooter here? This retro review has all of the answers, as part of my month of multiplayer madness reviews! A case of all style and no substance or something more? 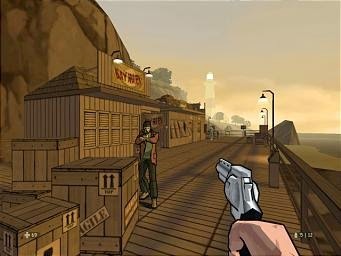 In 2003, back when Ubisoft was more well liked by the gaming community at large, the publisher released something that was one-of-a-kind at the time, a wholly cel-shaded shooter for what was then current gen consoles. The game was XIII, and it followed the cel-shaded craze that occurred in the early 2000's. Armed with a combination of stealth and action gameplay, XIII delivers on more than just being a pretty face... er... game. See why with my review. Found unconscious and injured on a beach, our protagonist Jason Fly suffers from a convenient bout of amnesia with little idea of who he is. All he has are flashes of memories that occur throughout the game and an accusation that he assassinated the President of the United States. What Fly enters into is a world of espionage, conspiracy, and killing in a story-driven first-person shooter that is based off a Belgian comic book series. Well, at least you won't need that Lasek procedure anymore. Helping the world and cast of characters feel like the comic series is an entirely cel-shaded world that manages to look exquisite and eye-catching more than ten years after XIII the game originally released. 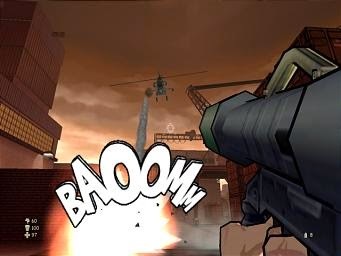 From the animated comic book panel story sequences to a trio of comic book panel popping up during gameplay whenever an enemy is given a shot through their cranium or falls from a high place, XIII feels like an interactive comic book with a wonderful mix of intense gunplay, action, and stealth to make a worthwhile and engaging game. 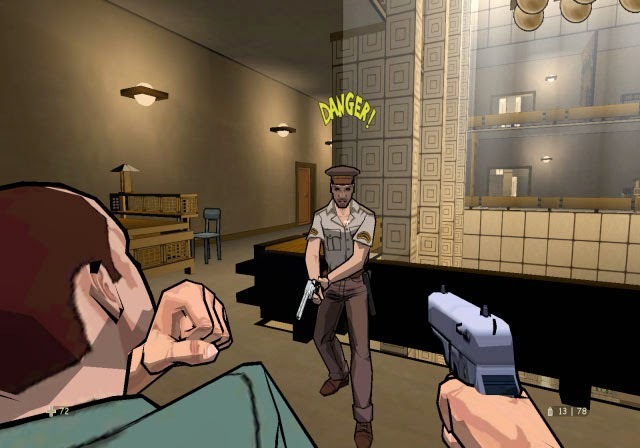 Though the voice work is a bit hokey at parts, the celebrity voice cast of David Duchovny, Eve, and Adam West do an admirable job of conveying proper emotion and the pulp comic book feel of the game. Boom! I mean, Bam! Headshot! XIII's campaign is an 8-12 hour romp, depending on the difficulty you decide to play on. Thankfully, if you find things are too hard or too easy, you can switch between difficulties during the campaign with no penalty. I tended to stay on the Arcade difficulty, the easiest of the three, as it provided enough challenge even as the least challenging mode. 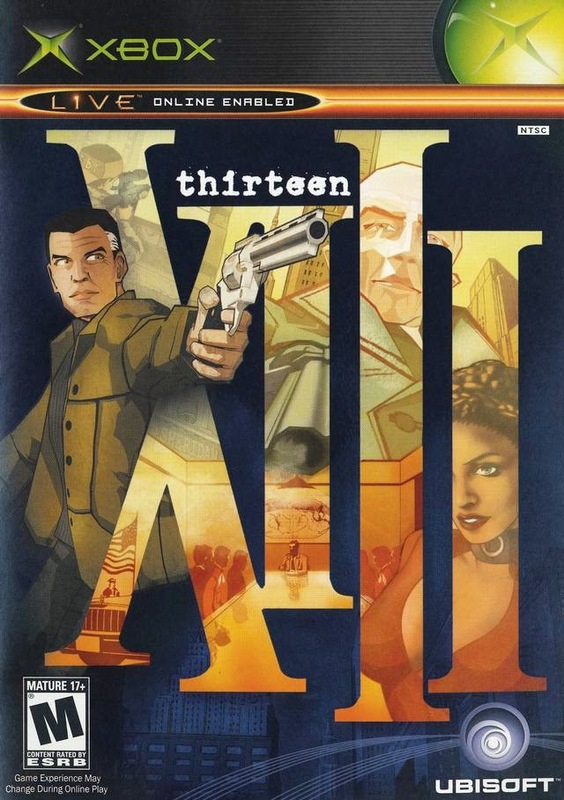 XIII has you going on a roller coaster of a ride in Jason Fly's journey to find out the truth behind the death of the U.S. President and the conspiracy behind it. It will take you through firefights on rooftops, isolated cabins in an arctic wilderness, around and inside a submarine, a battle on a dock, and inside the very heart of the conspirators' chambers. 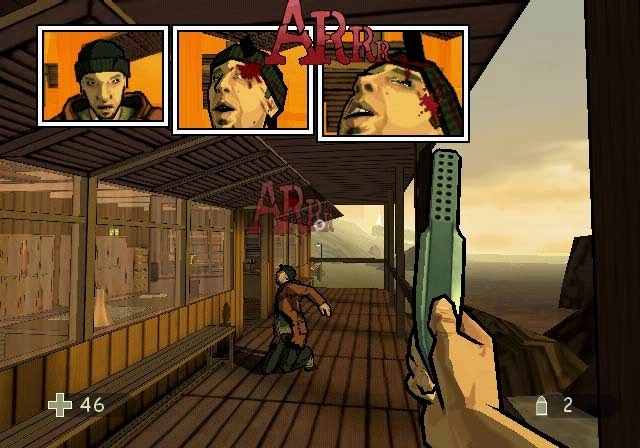 As stated before in this review, XIII is a blend of action and stealth gameplay. Sometimes you'll be asked to pump lead through as many enemies as possible along the way, while others you'll be evading their sights and taking them out in a subduing fashion so innocents don't die. You can pick up objects like chairs and broomsticks and smash them over the head of enemies to knock them out. Avoiding detection is of the utmost importance sometimes, so you'll have to also carry bodies to areas of levels where no one will spot an unconscious sack of skin and organs, thus calling in reinforcements. Sometimes this will have you fail the mission if other enemies are alerted to your presence. Other times it just means A LOT more guns being aimed at you. taking some shots at you. Fortunately, Jason Fly mysteriously has a sixth sense, allowing him to hear the presence of nearby enemies if he stays still. 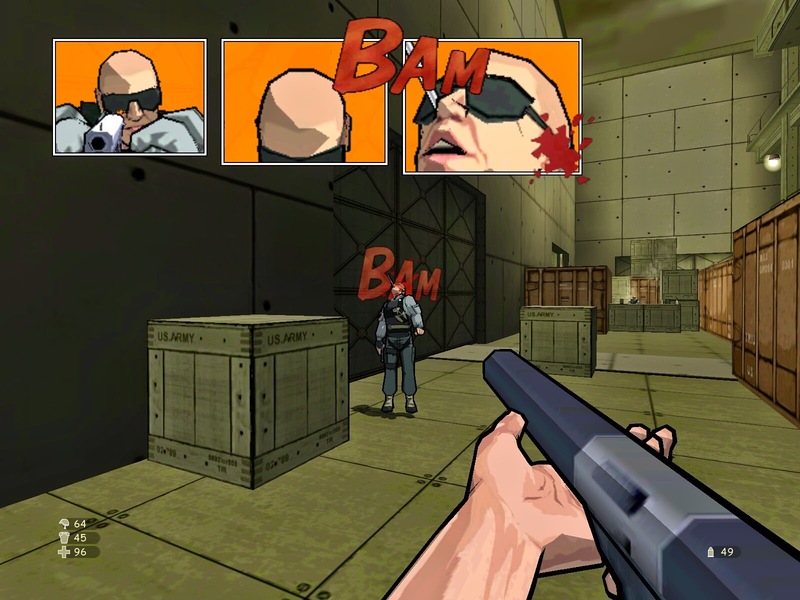 Enemy footsteps will appear on the screen with a "Tap, tap, tap" sound effect and series of comic book font words, indicating their position. This is a must to knowing when to take out patrolling enemies while staying out of sight. It's a cool mechanic that helps XIII feel different from other shooters than just by having a cel-shaded art style. Other times the goal of levels is to just make your way from Point A to Point B. Levels can occasionally offer a multitude of ways to get past foes. One level early in XIII where you're taken to an FBI facility as a suspect to the shooting of the President of the United States has you with the ability to either take out FBI officers with a heavy hit from a chair or you can pass through the ventilation system to pass them by completely. XIII still manages to impress even 12 years later. One of the coolest gadgets given to Jason Fly in his quest to uncover the truth is a grappling device of sorts that attaches to specially marked hooks, allowing him to raise and lower himself to out of the way areas, reaching high places, swinging across chasms, and other helpful uses. It's really cool to find special areas thanks to this awesome gadget. Meanwhile, however, in XIII, Jason Fly's weaponry isn't much to talk about. There are your standard weapons like pistols, magnums, assault rifles, shotguns, among others that don't really leave a mark in one's memory-- at least not as much of a mark as their bullets leave in a foe's body. As seen in the multiplayer mode, most of these are unbalanced unfortunately, meaning that you'll generally want to stick with a few favorites than utilize the entire selection of weaponry. Okay, okay. The Bazooka is pretty fun to use. Then again, when ISN'T a bazooka fun to use? The multiplayer itself is engaging enough, offering four different modes which give you the choice of playing on a specific set of maps depending on the mode chosen. There is your standard Deathmatch and Team Deathmatch, as well as Capture the Flag, a must for any multiplayer shooter. The maps leave a bit to be desired, mostly because of the limited amount of players available for most maps. Thankfully, if you lack friends or other forms of humans to play with, you can opt to battle against bots, a very welcome addition to shooters like XIII. Get up to four humans together to frag one another. XIII's campaign shines brighter than the multiplayer attached to the game, but the latter is certainly no failure of a mode. The story will keep you playing until the very, bitter end, and the level design in the solo campaign shines rather brightly. Sure, without the razzle dazzle of the cel-shaded engine, XIII might be just an average shooter, but with it, it scales great heights, offering visuals that are quite atypical for a first-person shooter. Throwing in an engaging story only further makes XIII a desirable game to play.